I can’t believe it’s been over a year since the last OS PhD workshop. Crazy! This time round I was no longer the newbie (although technically I’m still in year 1 of my EngD). The format was a little different this time round in that they did all the presentations in one go and then did questions with a panel of the speakers as well as expert from OS. Actually worked incredibly well and encouraged discussions rather than awkward silences or rushed questions. Brilliant idea whoever came up with that one. Gold star for you! Kelvin Wong – University College London – Why 3D? I was very happy to see 3D to be represented at such capacity at the PhD workshop. Clearly OS cares about it enough to have three of us! Andrew’s work is more on the remote sensing side of things which loses me at time. But in short, he is now looking at the final step of his research which is to run graph vectorisation to produce vectorized LoD2 roof shapes. SO COOL. I won’t talk about Jon or my work as it’s been talked about in previous posts. Now this was an interesting mix of talks, each one really looking at how we interact with data, how can we enhance it as well as introducing techniques from different disciplines into geo-applications. First up, Robin. using accessibility as an example, he looked at different routing and network datasets and assessed what is the best way to represent spatial analysis in the most useful format? Such a deep question! Next was Alex, an archaeologist turned GIS-er. Alex brought in techniques from archaeology to assess MasterMap and see how can we, just using building footprints, we can start building up characteristic signatures and understand the use. For example, a building which has a lot of ancilliary buildings may be a wealthy household with lots of sheds, conservatories and extensions. Pretty cool ideas. Third was Paul. I liked his project a lot, it was all about data scraping, postcodes and defining local neighbourhoods. While we have an idea of where a neighbourhood is, we most likely wouldn’t be able to draw a boundary and further this boundary wouldn’t be the same as someone’s perception of the neighbourhood. So is there a way we can work out where neighbourhoods are? Paul’s method is to scrape Google search and by searching postcodes, begin to form maps of where local neighbourhoods are. It’s very postcode and UK specific – I would love to see it done in other countries though. Think he said it’ll take a few weeks to do the whole of UK, would be cool to check out my area and see what his results show. The next day was more Geography-y. If day 1 was all about the technology and the data, day 2 was definitely all about the people. The first theme was mobile. First was Mike. His research is about how using location-based services affect our understanding of the world. Through ethnographic studies, he begins to elicit our experiences and perception of space. While incredibly fascinating, I wonder how he will account for the extremely fast moving navigation technology sector as well as the frequency of disruptive tech…. Second was Juliette. Now I was fascinated by her talk as her focus is on navigation. It was all about making navigational aids better and easier to understand, especially in our tech-laden world. What was most exciting is how she has plans to incorporate smartwatches, haptic devices (and maybe even AR!) and explore the effects of that on our navigation. I was really glad when I saw one of her experiments she did last summer with a bunch of students was almost identical in methodology as my Google Glass experiment. Phew! Anyway, really excited to see her work as it progresses. I think because navigation using GIS is so embedded in our daily lives, we are just fascinated about what the future holds. Now, the final theme, personal identity. This one blew my mind away, mostly because I found it incredibly difficult to grasp human geography/sociology concepts after spending the day before learning about canny edge detection. Saying that, both were wonderful presentations. Katherine and Iona are the newbies to the OS PhD pals and it was refreshing to see people excited to get stuck in with their research. Katherine focuses on Finsbury Park and looks at how to map local vernacular and how we can express diversity. Through interviews with local group leaders and ethnographic research, she plans to look at how Finsbury Park is a “constellation of trajectories” as we all experience the space around us. One of the interesting questions is, do these diverse groups use maps at all? Maybe. All in all, a really fun and interesting couple of days. I always revel in the opportunity to meet new PhD pals as they truly understand the ordeal great opportunity we all have. Thanks again to the OS lot for sorting this out, things are looking good on the OS research front. 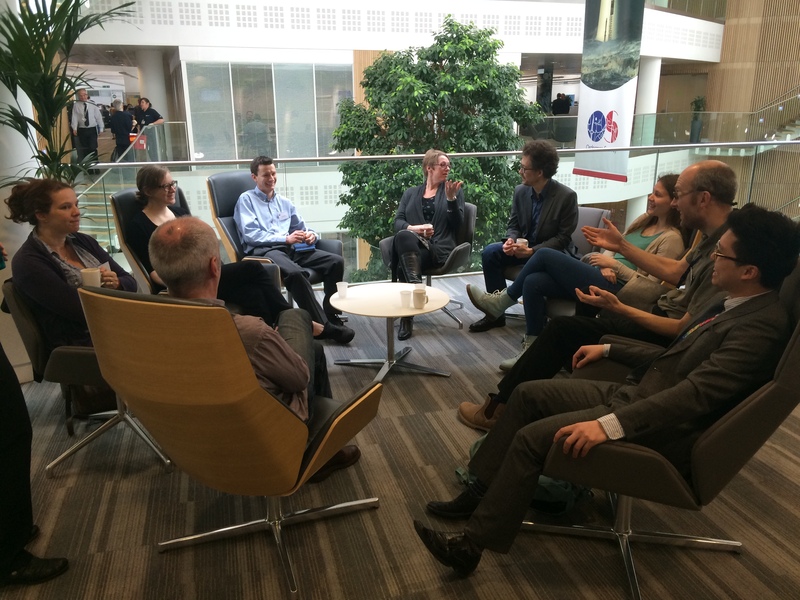 With 13 odd PhD pals and Jeremy Morley joining as their Chief Geospatial Scientist, I think there is plenty to look forward to 🙂 .